There are plenty of gluten-free breaded chicken products around, from dinosaur-shaped bites to store-brand nuggets. Yet they all share a common trait: they're frozen. Now a poultry-industry titan has raised the ante with a product you'll find elsewhere in the supermarket. 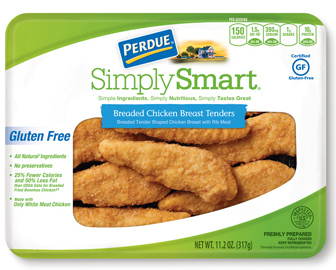 As part of its healthier Simply Smart line, Perdue has introduced refrigerated gluten-free breaded chicken breast tenders. (There is a frozen version too.) The chicken is boneless white-meat breast with rib meat and seasoned with chicken broth, vinegar, natural flavors, yeast extract, brown sugar and sea salt, while the breading ingredients are rice flour, water, yellow corn flour, yellow corn meal, rice starch, vinegar, salt, raisin juice concentrate, honey, natural flavors, soybean oil and yeast extract. The products have at least 25% fewer calories, 50% less fat, 25% more protein and less salt than breaded fried boneless chicken. The gluten-free renditions, which will be available nationwide, are also GFCO-certified. The refrigerated tenders are sold in 11.2 oz. packages (about nine pieces per package) and retail for around $5.99 each. Currently, Perdue is offering a dollar-off coupon.